Reuben Donnelley created the first official yellow pages directory in 1886, and it’s been a pretty good business to be in ever since. Traditionally these directories have been printed by the local phone company, and they more or less had a natural monopoly supported by network effects – since that’s where all the potential customers go, that’s where all the businesses want to be, and since all the businesses want to be there, that’s where all the customers go. As one would expect, margins in this business have been very, very high. As the search process continues to shift online (though slower than you may think), this cozy little market position has long appeared ripe for the picking by a wikinomics-enabled business approach. The challenge is creating a model that can scale fast enough to break through the network effects, and other natural advantages, that the Yellow Pages (and others) enjoy as their own directories are shifted online. Thanks to that little contact link on the left hand side of this page, I’ve recently discovered a new company called Brownbook.net that looks like they have the potential to do just that. One of the founders (Marc Lyne) dropped me a note a a little while back, I interviewed him about a week ago, and I must say that I’m impressed on many levels. It’s a very interesting example of an exceptionally lean, wikinomics-enabled company taking on some established incumbents… and what Brownbook is doing with prosumers in particular is something companies in many industries should pay attention to. The basic idea behind the company is simple. The founders read wikinomics and other such books and thought “why not apply these new rules to an old industry?” Given that they had some background in the business directory business, it seemed like a natural fit. In turn, they went about creating an online business directory that anyone could edit. But they quickly realized there was a problem – how could they create enough enough initial value / utility to get people to come to the site? This is a common problem these days – simply starting an “anyone can edit X on topic Y” site might have been good enough a few years ago, but there is a lot of competition for people’s attention now. Recognizing this, Brownbook bought some data sets in select markets to pre-populate the site. From this base things have been going well, with thousands of listings being added each week, and traffic on the site has been increasing about 20% a week. But this is where things start to get interesting. The business model for the company is straight forward. businesses can pay a small – and I do mean SMALL – annual fee to “claim” their company listing on the site, and thus control the messaging (users can still post their own reviews, etc.). They can also get additional services like notifications when reviews are added, videos, search priority, etc. This fee is many, many, MANY times (I can’t emphasize this enough) lower than what a company would pay to be listed in (say) the Yellow Pages – and could more or less be considered trivial for most companies. But if Brownbook can scale globally, the potential revenue for them is not trivial at all. So great – always good to see a business model. But here’s where another tricky question comes up – why would prosumers go to the bother of putting up listings of companies, and drive up the site’s popularity, just so the founders could potentially make a lot of money? From our experience, prosumers are highly, highly resistant to doing the heavy lifting when there’s somebody trying to make a lot of money off it it – and rightfully so. This is a particular area of interest for me, and I was all geared up to challenge Brownbook on it… but it turned out they were already a step or two ahead. Last week the company rolled out their “User Earnings” program (you can see a video of their CEO talking about it here). It’s very simple, and quite compelling. Any time a businesses comes and “claims” a listing (i.e. pays for control of it), the last prosumer to have made a significant change is rewarded. This reward is 20% of the lifetime value of that customer. That’s where my clever title of “getting prosumers invested for life” comes from. I think this is a very, very cool idea – for the most part, the prosumer examples I have seen either expect people to contribute time and effort for free, or alternatively for a shot at winning a winner takes all contest. There isn’t a lot out there right now between these two extremes. A model that makes prosumers a lifetime equity partner, in my opinion, has an extraordinary amount of potential – not only for brownbook, but in a myriad of other industries as well. On this front, one potential weakness that people may cite is that the opportunity to make a couple of bucks a year isn’t enough incentive for people to engage. While this may be true on one level, it makes the implicit assumption of millions of prosumers each putting up a listing or two here or there. From our experience, a natural hierarchy almost always emerges in these communities, with a small sub-set of people creating the vast majority of the content. While a couple of bucks a year might not be interesting, a few thousand bucks a year could be. The company may have to watch out for gaming however – one could envision a scenario where an individual does a lot of work, another makes a small edit after, and this latter person accrues all the rewards. As the company scales, they will likely have to adapt to such wrinkles. But it’s also interesting to note here that while the founders have built a big suite of controls and 30-point contingency plan in the background to help prevent against abuse, so far they’ve had to use it exactly once. Turns out people have been playing pretty nice so far. I want to mention one other thing on this. We’ve done a lot of research on what we call “hot house innovators” – typically companies that sharpen their competitive skills in tough emerging market conditions, and unleash their low-cost models on the world. Brownbook.net is not that – they are based out of the U.K. But when I interviewed Marc last week, he noted that their total employee count right now is less than 10. Their Canadian “sales force”, for example, consists of exactly one person, who isn’t really a sales person – they are tasked with promoting the model and getting businesses and prosumers engaged. As a comparison point, I looked up some stats on the Yellow Pages Income fund in Canada – it appears that they have 1,500 people in their sales force alone. Could wikinomics-enabled businesses that focus on prosumers be the developed economy equivilant of “hothouse innovators“? Denis – thanks for the write up. 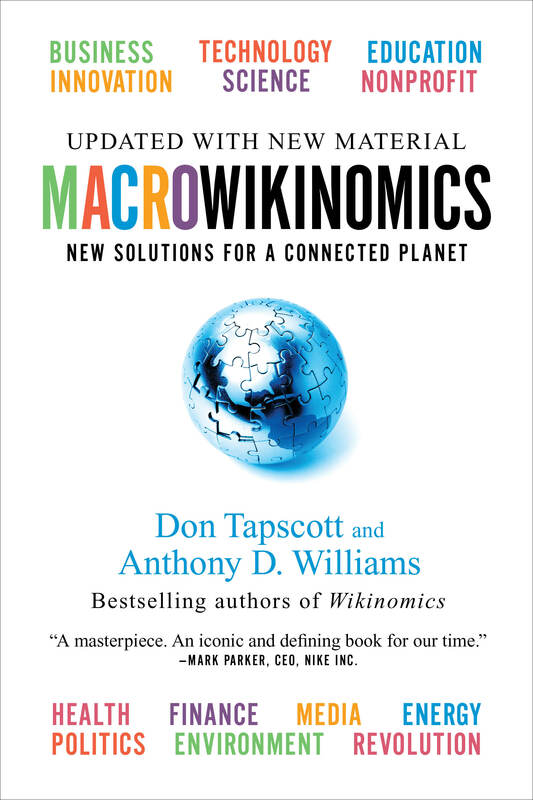 Wikinomics is the web Bible.